Tuebingen, a medieval town situated in southwest Germany, is remarkably well-preserved. With its crooked, cobblestoned streets and pointed gables, the pedestrianized "old town", which lies along the Neckar River, looks much as it would have in the 1600s. Numerous sidewalk cafes, pubs, shops, and restaurants make Tuebingen a very enjoyable place to stroll, while its outdoor cinema, festivals, art exhibitions, and theater productions offer a variety of cultural activities for students to enjoy. With its 87,000 residents - 23,000 of which are students - Tuebingen is very much a university town. The University of Tuebingen, founded in 1477, is a major center of higher education for international scholars, researchers, and exchange students. The University does not have a traditional “campus”, but rather is spread throughout the town. The arts and humanities departments, the library, and the main dining hall are near the old town, while more the modern science faculties are located in the hills that surround the town center. 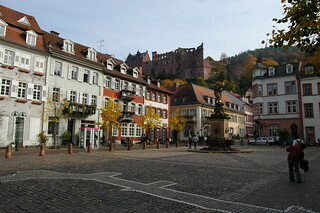 Hobart and William Smith Colleges maintain an exchange program with the University of Tuebingen, one of Germany's oldest and most prestigious universities. Its diverse faculty offer specializations in the fields of Protestant theology, Catholic theology, law, economics, business administration, medicine, philosophy, history, social and behavioral sciences, modern languages, mathematics, physics, chemistry, pharmacy, biology, geosciences, and informatics. While this program is ideal for students with advanced German language skills (who will take all courses in German), the university also offers a significant number of courses in English in a variety of subject areas, providing students the opportunity to develop German language skills while taking other courses in English alongside German and other international students. Advanced language students will take four courses (offered in German) and will receive a fifth course credit for an intensive German language course (Deutsch-Kompakt) offered during the orientation program at no extra cost. Students with more limited German language proficiency may take courses in English in a variety of subject areas and will also take a German language course at an appropriate level. To find courses and other information about the exchange program, click here. A list of courses offered in English is available at the Center for Global Education. This program can accommodate a variety of students and is designed for those who are interested in learning more about Germany and in developing German language skills. Students in religious studies, American studies, European studies, German area studies, literature, philosophy, economics and political science will find the program of particular interest. This program is open to all juniors and seniors (sophomores may be considered in exceptional cases) in good academic and social standing with a minimum GPA of 3.0. Advanced language students seeking a full immersion with all coursework in German must have completed the equivalent of four semesters of college-level German with a B average. Other students must have completed at least one semester of college-level German prior to the program and must take a German language course in Tuebingen. Exchange opportunities depend on the availability of slots at the host institution. Due to the challenging nature of study abroad, student academic and disciplinary records will be carefully screened. Note: due to the timing of the academic calendar at the University of Tuebingen, seniors participating in the spring semester will not be able to return in time for commencement on the HWS campus. The spring program runs from mid-March—July. Students will live in residence halls or apartments alongside other international and German students. There are communal kitchen/cooking facilities so that students may prepare their own meals or they may purchase affordable meals in the university dining halls. The Studentenwerk housing office in Tuebingen will assist students in finding housing. Students will be charged standard HWS tuition and fees and a $600 administrative fee. This will cover tuition for a four-course semester (five courses with the intensive German course for advanced language students) , health insurance, and the orientation program, including the intensive German course. Note that no room or board charge is included. Students will pay room fees directly and should plan to bring their board fee to cover meal expenses throughout the program. Room costs will vary depending upon the option chosen but should range from $2300—$2800. While meal expenses will vary according to individual tastes, we estimate that $2100—$2300 should be sufficient for students who prepare their own meals. (Full-year students will need to plan accordingly to cover two semesters). Additional expenses not covered include airfare, books and course-related materials, residence permit, and personal expenses (laundry, entertainment, ground transportation and independent travel). We estimate airfare for this program at $1000—$1200 from the East Coast, books and course materials at $250, and residence permit at $150. It is difficult to give an accurate estimate of personal expenses because student spending habits differ considerably. We would suggest a minimum of $1500 above and beyond meal and accommodation expenses. However, students on a tight budget should be able to manage with less. If you are concerned about finances, we strongly encourage you to talk to the CGE staff who can offer information and advice based on your specific situation. Students applying to study in Germany through CGE-sponsored programs are encouraged to apply for a Julius G. Blocker ’53 Fellowship. Those selected as “Blocker Fellows” receive support to cover a variety of expenses related to their study abroad program, including accommodations, meals, airfare, books and course materials, local transportation, and residence permit. Further information about this funding opportunity is available HERE. You may complete the Blocker Fellowship application as part of your online study abroad application. The Blocker specific essay and additional Blocker faculty recommendation form must be received by the general application deadline posted in your account.